– Dr. G.F. Rogers, the chief inspector of secondary schools in Ontario, addressed the graduating class of the Napanee Collegiate Institute. He told students they should be prepared to accept any job upon graduation as the time to pick and choose was gone. He also offered a comparison of the high school systems in Canada and Great Britain. 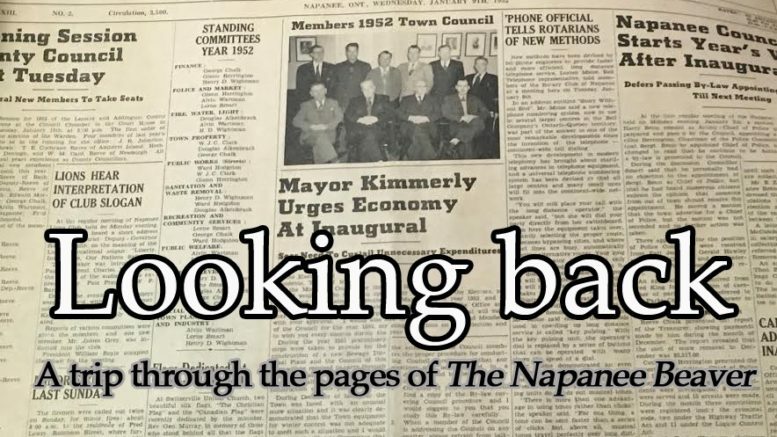 – At an annual meeting of the Napanee Public Library, it was disclosed that 18,908 books were circulated in 1938. It was also noted that 500 new titles were purchased. Some 55 per cent of the library’s members were from Napanee, while the rest came from surrounding areas. – The Ontario Department of Agriculture presented a long-service award to A.M. Fraser, the secretary-treasurer of the Ernestown Agricultural Society. Fraser had filled his with the organization staging the Odessa Fair since 1907. – County council protested paying the Lennox and Addington Children’s Aid Society 50 cents per child per day when it believed there were several good, available homes in the county where children could be taken care of for 40 cents a day. – The Union of Solicitor General Employees advised that guards at Millhaven Institute could walk off the job at the penitentiary if contract talks with the federal government were not accelerated. The members were looking for a higher wage, increased job security, and early retirement packages. Following a work-to-rule campaign by staff, inmates also refused to work, stating they wanted higher wages, free Tylenol, better food, and more free time. – A Petro Canada station was evacuated and Hwy 401 closed in both directions after a tanker truck began leaking ethyl alcohol. The leak was detected as the driver stopped at the service station 15 km east of Napanee on the westbound highway. The shipping company that owned the truck, Provost Cartage, sent another truck to pump out the remaining alcohol. The Ministry of Environment’s spills control team and the Ernestown Township fire department were at the scene to ensure the transfer went smoothly. Traffic was rerouted to Hwy 2 as the operation continued. – Kaladar was one of five remote communities in eastern Ontario that would test a new pilot program that would see established retailers become agency stores for the LCBO. If everything went well with the pilot, stores in other areas could apply. Store owners would receive 10-per-cent commission on the first $89,000 of annual alcohol sales.